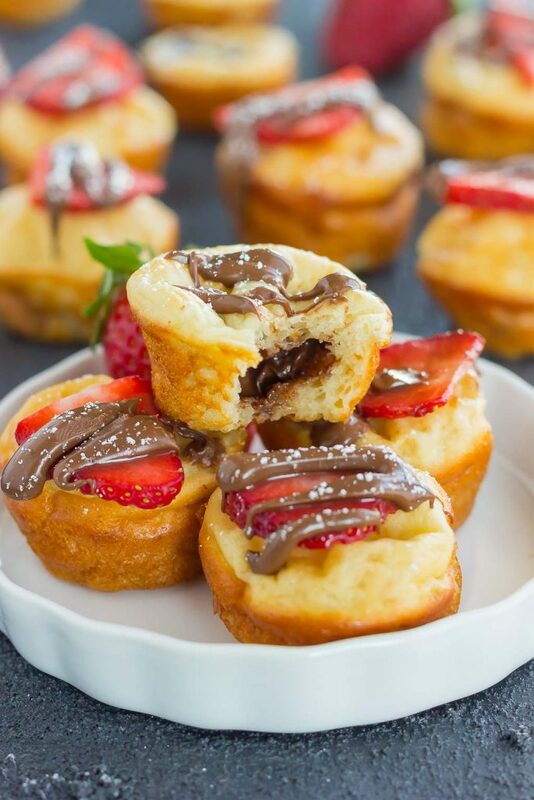 These Nutella Stuffed Pancake Bites are a quick and easy breakfast that’s packed with flavor. A Greek yogurt pancake batter is filled with Nutella and then baked until fluffy and golden. No flipping or heating a griddle is required, as you can have these bites ready in no time! It’s time to break out the Nutella, friends! It’s been just a little too long since I’ve baked with Nutella, so I’m changing that today. And, of course, it’s no secret that Nutella and I are practically best friends! From these Strawberry Nutella Overnight Oats, to those Brownie Bites with Nutella Frosting, these Mint Nutella Energy Bites and Pumpkin Nutella Muffins, I love it all. And you know what else I love? Pancakes! 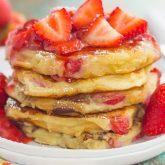 My Strawberry Greek Yogurt Pancakes and Blueberry Greek Yogurt Pancakes are two of the most popular recipes on Pumpkin ‘N Spice, and for good reason! They’re soft, thick, fluffy, and on the healthier side. What’s not to love? So, I decided to get a little creative today and take my greek yogurt pancake batter and make it into pancake bites. Specifically, these Nutella Stuffed Pancake Bites! While I l-o-v-e pancakes, sometimes I seriously hate the flipping part! They end up lopsided, too spread out, and just not pretty. 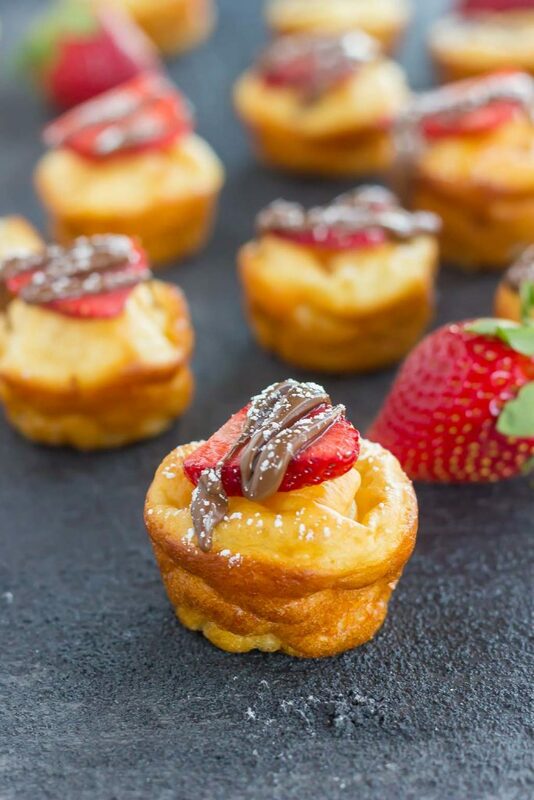 But with these Nutella Stuffed Pancake Bites, no flipping is involved! Simply make the batter like normal, and then pour into mini muffin tins. How easy is that?! And because I used the same batter as in these Strawberry Greek Yogurt Pancakes, the bites are on the healthier side, too. Until the Nutella is added in, but who’s counting? And like most of my recipes, these pancake bites are a breeze to whip up. You can have this prepped and ready to pop in the oven in less than 10 minutes. 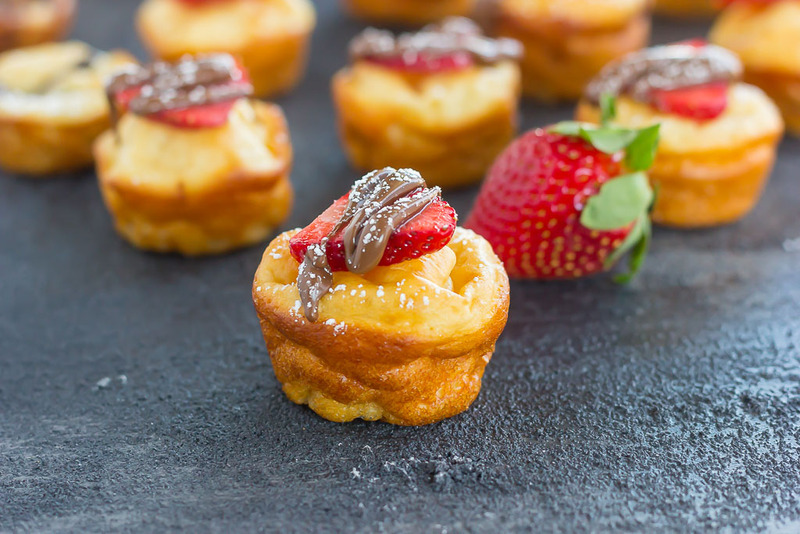 I like to serve these Nutella Stuffed Pancake Bites with sliced strawberries and a dusting of powdered sugar, but they’re equally delicious on their own, or with maple syrup. And the middle! These pancake bites are filled with ooey-gooey Nutella, which is even more decadent when they’re straight from the oven or warmed in the microwave for that gooey factor. 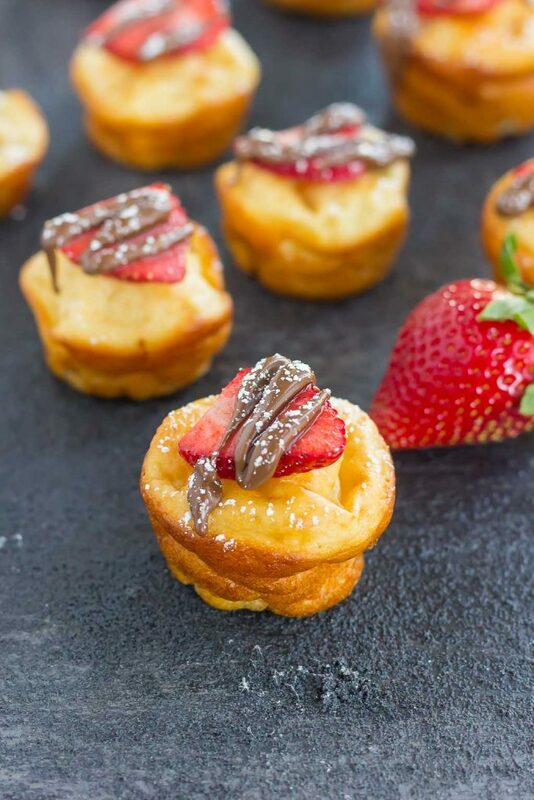 One bite of these Nutella Stuffed Pancake Bites and I guarantee you’ll be hooked! Easy to make and even better to eat, these were made for pancake and Nutella lovers everywhere! Looking for more pancake recipes? I’ve got you covered! These Nutella Stuffed Pancake Bites are a quick and easy breakfast that's packed with flavor. A Greek yogurt pancake batter is filled with Nutella and then baked until fluffy and golden. No flipping or heating a griddle is required, as you can have these bites ready in no time! Preheat oven to 350F. Lightly spray two 24 count mini muffin tins with non-stick cooking spray. Set aside. Fill each muffin tin 1/4 full. Spoon 1/2 teaspoon of Nutella into each tin. Top each tin with remaining batter, filling 3/4 of the way full. Bake for 15-17 minutes, or until center is set and lightly golden. Remove from oven and let cool for 10 minutes. Then move to a wire rack to cool completely. 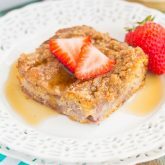 Serve with sliced strawberries and powdered sugar or maple syrup, if desired. Whoa! These are amazing! I don't even need one bite to be hooked...I'm hooked just looking at them! What a brilliant idea, Gayle!! And you really can't go wrong with pancakes for breakfast and then add Nutella to the mix? YES please! 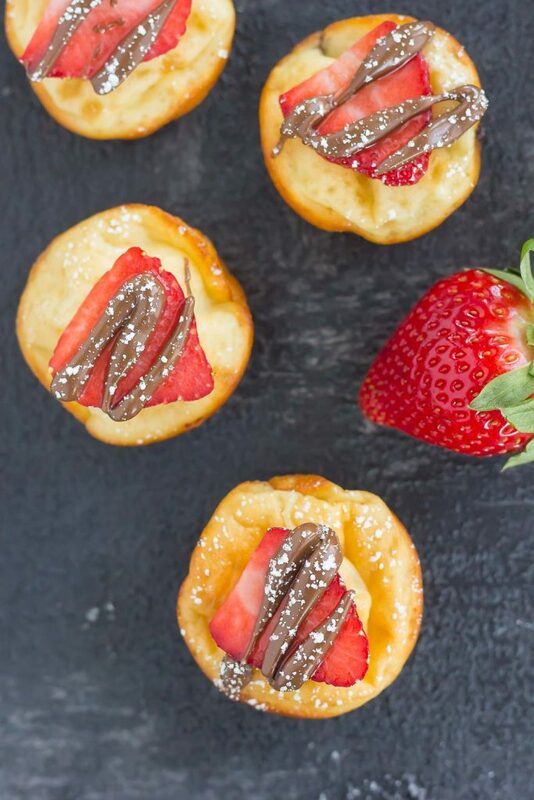 I love how bite sized these are, but, truth be told, I know I'm going to be poppin', like, a million of these , lol :D Love the sliced strawberry garnish cause strawberry + Nutella = super yum! Pinned, of course. Happy Monday! Nutella makes everything better, right? Thanks for the sweet comment! Anything that involves Nutella is a guaranteed winner in our house! For a bunch of pancake-loving kids, this is the ULTIMATE breakfast treat! For sure, nutella makes everything better! Thanks, Blair! Isn't flipping the worst? I always get so nervous when I'm about to do that! :) Thanks for the sweet comment, Cheyanne! Aren't these just the cutest things? I love pancakes but sometimes I'm just not in the mood for all that flipping. This is the perfect way to avoid that, and topping them with Nutella and strawberries sounds amazing!! Thanks, Marcie! I hate the flipping part too, which is why bites are so perfect! These. Are. Adorable! And it's been too too too long since I had me some Nutella! Aww thanks, Demeter! You got that right...these do qualify for fun mini foods! :) Hope you have a great rest of your week! pancake bites? Yes please! these sound amazing Gayle! I love these stuffed pancake bites! Such a great idea and they're totally adorable! My kiddos would polish these off in no time! And yay for no flipping too! Holy moly these look delicious and have been pinned! I also dislike flipping pancakes... And it's been WAY too long since I've broken out the Nutella! Thanks for the pancake love, Sues! Thanks for the pancake love, Gaila! Isn't nutella the best? Oh my gosh, these are SO cute! My entire family (including my 15 month old) would go crazy for them! What a great idea! These look amazing! Can't wait to try them! This is quite lovely! And it looks so great! Definitely a winner. What a fantastic idea to stuff pancakes with Nutella! I'm in love with the mini bite size! Mini bites are the best! :) Thanks, Rachelle! 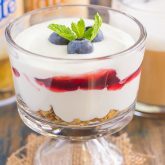 Wow, great recipe and idea. 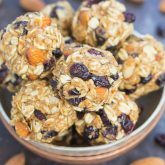 These look delish and incredibly easy to make. I will definitely try it! Thanks for the kind words and for stopping by, Mira! Can you substitute gluten free flour? Hi Claire! I've never tried that before, so I'm not sure how it would turn out. You could definitely try, though! Thanks for stopping by and hope you enjoy! Just finding these and they look amazing. Thank you for posting. Could these be made ahead? I’m doing a baby shower brunch and I need as much as possible done ahead. Hi Jackie! I've never made this ahead, but I wouldn't see why these wouldn't turn out. I hope you love these if you try them! Hi Jackie! I've only ever eaten them warm, so I can't say for sure. Can these be made ahead & frozen? Prepping for a holiday brunch this weekend & trying to get some items done in advance. Hi Kathleen! I've never tried to make these ahead or freeze them, so I honestly have no idea how it would turn out. I would think maybe you could make the batter ahead of time and refrigerate until ready to bake? Just a guess though. Hope you love them if you try them!